and the slanted row that leans to the right, those are k2tog, followed by a yo. [/x_text][/x_column][x_column bg_color=”” type=”1/2″ style=”padding: 0px 0px 0px 0px; “][x_text]On a chart, this is what one of those slanted rows looks like. Pretty similar, no? Remebering to read the chart right to left, you know the pattern here involves k2tog, yo with a number of knit stitches before and after that. [/x_text][/x_column][/x_row][/x_section][x_section style=”margin: 0px 0px 0px 0px; padding: 45px 0px 45px 0px; “][x_row inner_container=”true” marginless_columns=”false” bg_color=”” style=”margin: 0px auto 0px auto; padding: 0px 0px 0px 0px; “][x_column bg_color=”” type=”1/2″ style=”padding: 0px 0px 0px 0px; “][x_image type=”none” src=”http://owlcatdesigns.flywheelsites.com/wp-content/uploads/2016/02/IMG_0003.jpg” alt=”” link=”false” href=”#” title=”” target=”” info=”none” info_place=”top” info_trigger=”hover” info_content=””][/x_column][x_column bg_color=”” type=”1/2″ style=”padding: 0px 0px 0px 0px; “][x_image type=”none” src=”http://owlcatdesigns.flywheelsites.com/wp-content/uploads/2016/02/ssk-simple.png” alt=”” link=”false” href=”#” title=”” target=”” info=”none” info_place=”top” info_trigger=”hover” info_content=””][/x_column][/x_row][x_row inner_container=”true” marginless_columns=”false” bg_color=”” style=”margin: 0px auto 0px auto; padding: 0px 0px 0px 0px; “][x_column bg_color=”” type=”1/2″ style=”padding: 0px 0px 0px 0px; “][x_text]This swatch shows a very similar pattern, but this time the column of knit stitches slants to the left. The directional decrease shown here is a ssk, or slip, slip, knit. So the stitches get turned (by slipping them one at a time) and then knit together through the back, in effect reversing and mirroring the decrease we looked at above. [/x_text][/x_column][x_column bg_color=”” type=”1/2″ style=”padding: 0px 0px 0px 0px; “][x_text]On a chart, this is what one of those slanted rows looks like. The slanted lines on the chart are decreases, and you can see the same slant as in the stitches in the swatch to the left. [/x_text][/x_column][/x_row][/x_section][x_section style=”margin: 0px 0px 0px 0px; padding: 45px 0px 45px 0px; “][x_row inner_container=”true” marginless_columns=”false” bg_color=”” style=”margin: 0px auto 0px auto; padding: 0px 0px 0px 0px; “][x_column bg_color=”” type=”1/2″ style=”padding: 0px 0px 0px 0px; “][x_image type=”none” src=”http://owlcatdesigns.flywheelsites.com/wp-content/uploads/2016/02/k2tog-repeat-b.png” alt=”” link=”false” href=”#” title=”” target=”” info=”none” info_place=”top” info_trigger=”hover” info_content=””][/x_column][x_column bg_color=”” type=”1/2″ style=”padding: 0px 0px 0px 0px; “][x_text]Most of the time, when you are working from a chart, there will also be a visible border to tell you which stitches need to be repeated. Most knitted things are not just 10 stitches wide after all, unless you are making a broomstick cozy! or it will say something like * repeat from * to last 4 sts. Learning to work from charts is a great skill to take your knitting to the next level, many of the more complex patterns (and increasingly patterns in books and magazines) are available charted only, for a variety of reasons. First off is that it allows the user to have a visual representation of the item they are creating and it’s therefore easier to spot mistakes as you knit. Another reason is space, and that is why magazines, where page space is at a premium, use charts for almost anything. To some this may sound like a scary new invention, but most colorwork traditionally has been charted, many cabled designs as well; and all the old German lace patterns are charts only. When you start out having knit from long strings of syntax, charts might seem daunting, but with a little practice working from a chart which is a visual representation of your work, will become second nature and you’ll ask yourself, why you didn’t make the switch earlier. No different from when you started to learn to read patterns and had to learn that k2tog meant ‘knit 2 stitches together as if they are one stitch’, or yo meant ‘yarn over’ you will soon form the mental link between a symbol that slants to the right and a k2tog or a O and a yarn over! Or a block of yellow with having to knit that stitch in yellow. So let’s get started with some of the basics. One thing you want to determine when looking at a chart is what type of chart is it? Color work, cable, or lace? Or a bit of everything? [/x_text][/x_column][/x_row][/x_section][x_section style=”margin: 0px 0px 0px 0px; padding: 45px 0px 45px 0px; “][x_row inner_container=”true” marginless_columns=”false” bg_color=”” style=”margin: 0px auto 0px auto; padding: 0px 0px 0px 0px; “][x_column bg_color=”” type=”1/3″ style=”padding: 0px 0px 0px 0px; “][x_image type=”none” src=”http://owlcatdesigns.flywheelsites.com/wp-content/uploads/2016/02/color-chart.png” alt=”” link=”false” href=”#” title=”” target=”” info=”none” info_place=”top” info_trigger=”hover” info_content=””][/x_column][x_column bg_color=”” type=”2/3″ style=”padding: 0px 0px 0px 0px; “][x_text class=”left-text “]The colorwork charts are super easy, each block is a stitch, and you work the stitch in the color shown, so we won’t go into too much detail on those at this point. In this example you would have 4 stitches, and row 1 is worked knit 2 in brown, and then knit 2 in white. [/x_text][/x_column][/x_row][x_row inner_container=”true” marginless_columns=”false” bg_color=”” style=”margin: 0px auto 0px auto; padding: 0px 0px 0px 0px; “][x_column bg_color=”” type=”1/3″ style=”padding: 0px 0px 0px 0px; “][x_image type=”none” src=”” alt=”” link=”false” href=”#” title=”” target=”” info=”none” info_place=”top” info_trigger=”hover” info_content=””][/x_column][x_column bg_color=”” type=”2/3″ style=”padding: 0px 0px 0px 0px; “][x_text class=”left-text “][/x_text][/x_column][/x_row][x_row inner_container=”true” marginless_columns=”false” bg_color=”” style=”margin: 0px auto 0px auto; padding: 0px 0px 0px 0px; “][x_column bg_color=”” type=”1/2″ style=”padding: 0px 0px 0px 0px; “][x_text]What we will look at first in our series of tutorials here are simple lace charts. Keep in mind, some of the basic formulas apply to all charted knitting patterns. The first thing you always want to do is determine if the chart shows RS only, or if it has both RS and WS rows on it. Often the accompanying text will clue you in on this. If they are on the right side only, your chart is only showing you right side rows. If they are on both sides, alternating like int he bottom example, the chart shows you both RS and WS rows. [/x_text][/x_column][x_column bg_color=”” type=”1/2″ style=”padding: 0px 0px 0px 0px; “][x_image type=”none” src=”http://owlcatdesigns.flywheelsites.com/wp-content/uploads/2016/02/chart-combined.png” alt=”” link=”false” href=”#” title=”” target=”” info=”none” info_place=”top” info_trigger=”hover” info_content=””][/x_column][/x_row][/x_section][x_section style=”margin: 0px 0px 0px 0px; padding: 45px 0px 45px 0px; “][x_row inner_container=”true” marginless_columns=”false” bg_color=”” style=”margin: 0px auto 0px auto; padding: 0px 0px 0px 0px; “][x_column bg_color=”” type=”1/1″ style=”padding: 0px 0px 0px 0px; “][x_text class=”left-text “]The RS only or both sides is very important for how you read the chart! i.e. from right to left on RS rows, and left to right on WS rows. Our first chart shows some rows of yo and k2tog combinations. The row numbers are on the RS only, and notice how there are only odd numbers of rows? That is another good clue that your chart is skipping every other row, namely the wrong side rows! and the / is a k2tog. 3. Turn your little strip 90 degrees, so one long side is on the top. 4. Pick up and knit stitches along the long edge. Here I picked up 6 (3 are the original 3 from before you turn, see?). In Khyber Pass you will pick up 9 sts. 5. Pick up and knit 3 more stitches from the cast on edge. 6. 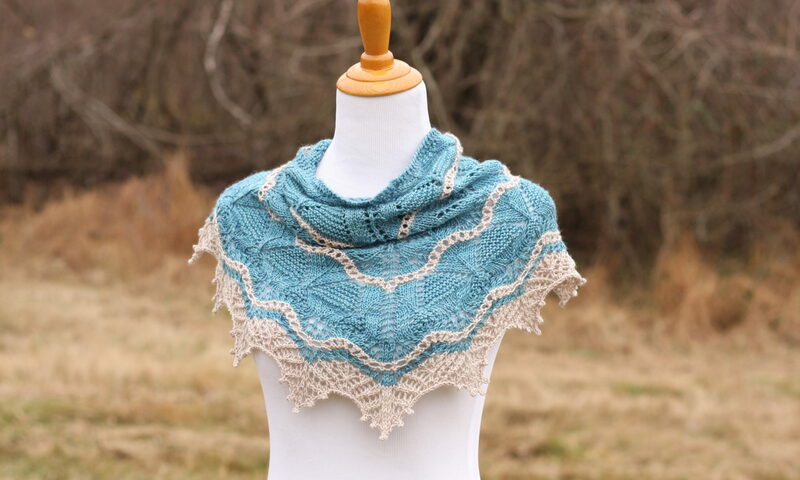 This is what it looks like in a finished shawl. It blends in perfectly and you can’t tell where exactly it was! 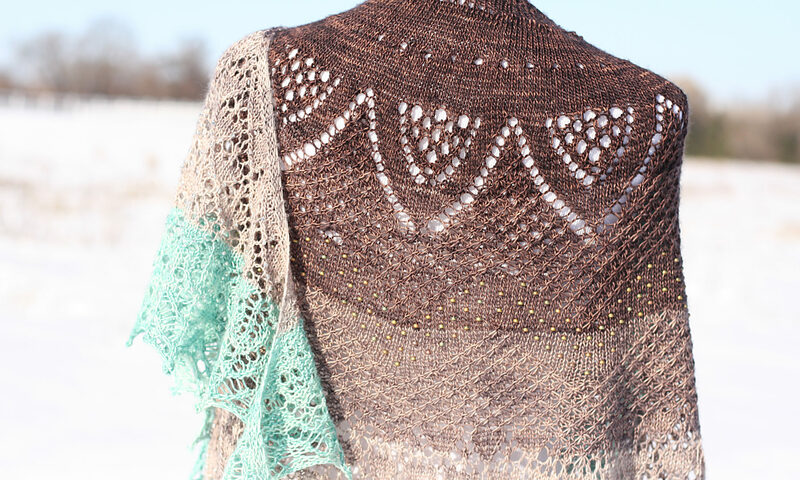 Khyber Pass is a striking top down crescent shaped shawl with lace sections that alternate with a garter and eyelet pattern. The garter ridges add warmth and substance for your trip over the high mountains and the lace, inspired by snowcapped summits and frost, adds an element of lightness. All wrong side rows are rest rows, making for a relaxing yet satisfying knit. ‘cross passes high, ere we may rest. 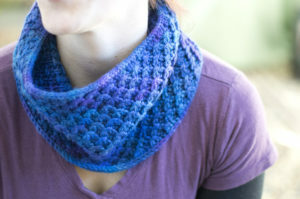 Ever since making Rinde, I have been in love with textured single loop cowls. Warm yet not bulky, they snug into your coat without gaping, and never give you that ‘turtleneck choke-hold’ feel! The Winter Silk Cowl comes in two lengths, for those knitters who share my love for single cowl snuggliness, as well as those of you who prefer the double-wrapped infinity look. This cowl is worked in the round using a deep, cushy stitch pattern that looks like it consists of two distinct layers of fabric. I-cord cast on and bind off complete an elegant, finished look. Mountain Colors ‘Winter Silk’ (50% wool/50% silk, 200 yards/183 m, 3 oz/90g). Sample shown in ‘Winter Sky’ Sizes A (B) use approx. 180 (370) yards /165 (338) meters of DK weight yarn. US Size 7 (4.5 mm) circular needle, 16”(40 cm), or size to obtain gauge, plus needles one size larger for CO only. All patterns have been professionally edited and tested. Top down cowlette is started flat and first knit like a triangular shawl, then joined in the round in the classic cowlette shape. Quick to knit up, this easy to wear little gem that won’t slide off your shoulders adds just the right touch of elegance to any wardrobe! Schaumkronen (lit. Crowns of foam) are what is commonly known as whitecaps or white foam crests, this happens at a strong breeze or at about a windspeed of 6 on the Beaufort scale. my waves are crowned in caps of white! Available on Ravelry for $7. [x_section style=”margin: 0px 0px 0px 0px; padding: 20px 0px 45px 0px; “][x_row inner_container=”true” marginless_columns=”false” bg_color=”” style=”margin: 0px auto 0px auto; padding: 0px 0px 0px 0px; “][x_column bg_color=”” type=”1/1″ style=”padding: 0px 0px 0px 0px; “][x_custom_headline level=”h2″ looks_like=”h3″ accent=”true” class=”center-text “]Fingge[/x_custom_headline][x_gap size=”10px”][/x_column][/x_row][x_row inner_container=”true” marginless_columns=”false” bg_color=”” style=”margin: 0px auto 0px auto; padding: 0px 0px 0px 0px; “][x_column bg_color=”” type=”1/3″ style=”padding: 0px 0px 0px 0px; “][x_text]These slippers are like wearing handmade sheep on your feet, little clouds of comfort! Worked in one piece, the sole is knit back and forth and is HEAVILY thrummed to give extra cushioning. The sides are worked in the round and the instep is again worked back and forth with a few shortened rows to bring the back of the slipper up and leave the front lower for easy in and out! And in case you are wondering, ‘Fingge’ simply means slippers in Swissgerman, my native tongue.